Tags containing: "non human traffic"
There are many estimates for how much the digital advertising industry loses to ad fraud every year. Whether the number is $6 billion or $60 billion, fraud is a critical issue that causes advertisers to waste their ad spend and digital publishers to miss out on revenue that is stolen by fraudsters. There are steps that everyone in the supply chain—including publishers—can take to protect their businesses against fraud. Here are a few suggestions to reduce your website’s risk for becoming a target for ad fraud. Legitimate publishers work hard to create quality content and drive audiences to that content. There are vendors that sell a fixed number of website visits for a fixed price. If the promise of generating a fixed number of website visits for a few dollars seems too good to be true, that’s because it probably is. A publisher might not know that the traffic is robotic because it was designed to pass through fraud detection as human. The best way to keep bots off your site is to avoid buying sourced traffic. Drive human audiences to your website through legitimate marketing activities such as email campaigns, sponsored social media posts and search engine marketing. There are some easy-to-implement preventive tools publishers can use to increase human interaction and limit bots. Encourage users to register for website access or implement a paywall. CAPTCHAs are another method that give users simple tests that only humans can answer. Newer CAPTCHA programs are efficient at determining whether a visitor is a human with little or no user input. Another non-intrusive technique to detect bots is referred to as a “honeypot,” which is an invisible image or form field on a webpage. While humans can’t see it, bots parsing through the html code will interact with it. Once identified, this nonhuman traffic can be filtered out of site measurement reports. It is important for publishers to understand where their site traffic is coming from and to continuously monitor traffic sources. A critical part of every digital marketing campaign is setting up the landing page URL to determine which campaign is responsible for traffic. A publisher might drive traffic by running a social media contest or sending an email blast. These types of marketing activities can be easily identified in web analytics. However, if the source is unknown or if the traffic exhibits suspicious characteristics such as spikes at unusual times or if it’s coming from one location or device type, these are red flags that the publisher needs to address. Publishers can take the proactive step of protecting media buyers by filtering traffic from bots and data centers and encourage their advertising partners to do the same. This prevents ads from being served to nonhuman traffic and increases exposure to real viewers. Ad fraud detection services are a significant part of how the market transacts because they measure general and sophisticated invalid traffic and add friction to combat fraud. There are, however, limitations to any technology and different methodologies used, so it’s important to implement good business practices and human intervention to guard against bot traffic on your site and help minimize the risk of fraud. Quality publishers do everything possible to minimize the risk of exposing their clients to fraud. By adhering to best practices, you can assure advertisers that you are taking necessary steps to attract human audiences and eliminate bots. Work with accredited vendors you can trust (and make sure those vendors do the same). Establish good business practices for monetizing your site such as those mentioned above. Educate your staff to make sure they know that they are responsible to follow best practices. Keep up with current and upcoming industry solutions. Publisher adoption of ads.txt, for example, helps demand-side platforms detect unauthorized digital sellers. With the release of OpenRTB version 3.0, which includes “Ads.cert: Signed Bid Requests,” the industry is taking the next step to improve transparency and security in the buying and selling process by ensuring that bid requests cannot be tampered with by downstream parties. Engage in an independent, third-party audit to identify areas for improvement and show advertisers that you are taking steps to provide transparency and a safe place to reach their target audience. Learn more about what you can do to help minimize ad fraud by downloading the AAM white paper: Three Truths That Help Confront the Digital Ad Fraud Crisis. As Chief Technology Officer at Purch, John Potter brings a wealth of experience having spent more than a decade with CBS Interactive/CNET, where he held many roles. Most recently he served as Vice President, Software Engineering, managing a staff of 100+ developers in support of brands like CNET, CBS News, ZDNet and Download.com. 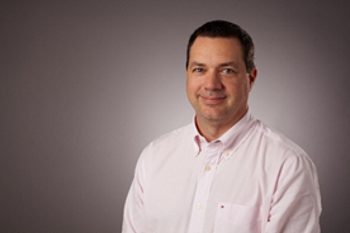 John holds multiple patents for his system designs that improve Internet connectivity and document classification. At Purch, his role entails managing all aspects of technology, engineering and operations, and he has successfully participated in, and integrated 10 acquisitions. Could you describe / define ad fraud? John: Ad fraud is a persistent problem that, according to the IAB, costs the industry $8.2 billion a year in the U.S. While ad fraud is found in various forms, from a publisher’s vantage there are two main problems: One is fraudulent copies of sites that are created, and whose advertising inventory is then presented on programmatic platforms as coming from the original publisher sites. To add insult to injury, most of the traffic on these fraudulent sites is from bots. The other is non-human traffic on legitimate publisher sites from bots scraping the sites, attempting to insert comment links, or coming through content recommendation systems in an attempt to defraud them. Each of these problems causes different issues and needs to be responded to differently. How have issues such as bot traffic and audience verification impacted the digital advertising marketplace? John: The prevalence of non-human traffic and fraudulent or non-viewable advertising inventory has led to an undermining of marketer trust in internet advertising. This directly harms all publishers. Just as importantly, it has led to the need for marketers to add software to their creatives to confirm viewability and detect non-human traffic. This increases the size of ad creative degrades the user experience on publisher sites. Then there are multiple, competing measurement systems in use. All this complicates the ability of publishers to deliver on marketing campaigns. Are these issues particularly problematic given the rise of programmatic? John: Yes, all of these issues have been compounded by the rise of programmatic. Marketer’s campaigns are running across a larger number of sites, most of which they have no direct contact with. This makes fraud a lot harder to detect than when you are signing a direct deal. Why is it important to understand/have an accurate picture of the audience being reached? John: In the end, all marketing is targeted at particular audiences. As publishers, it’s our ability to provide those audiences that makes us valuable to marketers. At a minimum, marketers should be able to expect that any ads they purchase will be viewed by real humans on a legitimate site that is brand-safe. Publishers and programmatic platforms need to do everything they can to make sure we meet that minimum expectation, and initiatives like TrustX can help with that. How should the industry be addressing ad fraud? John: First, publishers and the programmatic platforms need to cooperate to wipe out fraudulent advertising inventory. Ads.txt is a great start towards this, but it’s just a first step. I’m really enthused about the potential of blockchain solutions that will track advertising at every step of the process, and leave an auditable trail. Ideally, we get to the point where every advertising impression sold and served is auditable by all parties to the transaction. Publishers also need to work hard to block fraudulent traffic on their sites. At Purch, we already do a lot to block bots from our sites, and to prevent advertising being served to any that get around our blocking attempts. We’ve now moved on to integrating real-time bot detection and ad blocking into our server-to-server header bidding platform. I know other publishers and programmatic platforms are taking this issue seriously as well, but it will need to be a continuing concern for a long time to come. The illustration used in this article, Picco Robots, is reproduced, with modifications, under a creative common license. Tracking digital ad fraud is more essential than ever in the marketplace. 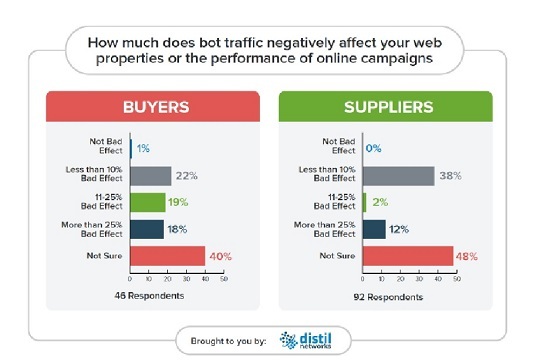 Distil Networks offers insight into publisher and advertiser concerns about non-human traffic (bots) and digital ad fraud in their report A Digital Publisher’s Guide to Measuring and Mitigating Non-Human Traffic. The report is based on an online survey among 138 buyers and sellers of digital advertising. Surprisingly, many still know little to nothing in terms how online fraud activity is affecting their business transactions. Forty percent of buyers and 48% of suppliers reported that they did not know how much bot traffic negatively impacted their online campaigns and/or web properties. Interestingly, more than a third of advertisers (37%) are willing to pay at least an 11% premium for certified human traffic. 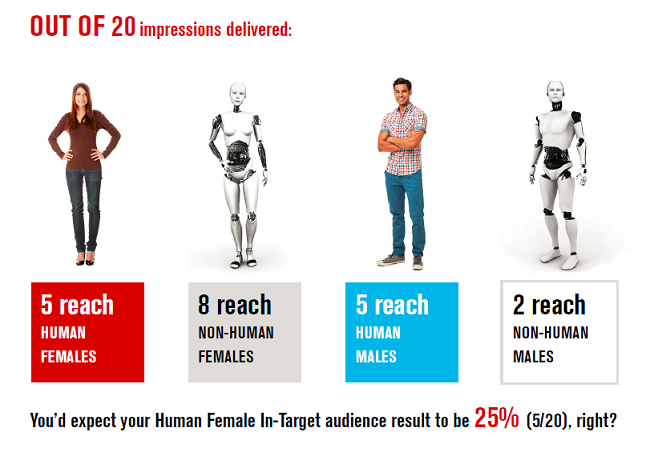 Click & impression fraud – bots loading and clicking on links (100% and 82%, respectively). Skewed analytics – difficulty of separating human traffic from bot traffic in order to optimize for human traffic (50% and 49%, respectively). Lead fraud and fake registrations – form spam and bot-driven form filling (32% each). Content theft – where web scrapers are simply taking down content from sites (23% and 14%, respectively). Login attacks – large numbers of failed username and password entries (9 and 8%, respectively). total impressions, viewable impressions are easily impersonated by bots and non-human traffic. transparency, where ad suppliers provide proof of where each impression was served. For those that have been watching the move to digital for decades, it’s often hard to appreciate how much transformation is still going on. We’re literally writing history and building the future of digital media every day. The value to consumers coming from the technology, automation and innovation does not cease to astound. DCN continues to point out that the humans setting the rules also need to keep up with the pace of change. I’m not talking about the ones on Capitol Hill but rather the leaders and the decision-makers in the media and tech companies and their self-regulation bodies. We must show a higher set of ethics and concern for the industry and its future. I’ve been pleased to see that in the past year we’ve elevated the discussion: Thought-leaders as varied as Om Malik, Tim Berners-Lee, John Battelle, Fatemeh Khatibloo, Andrew Keen, Tony Haile and countless others have taken on the types of issues that will help pave the way for the content and services that consumers trust and love. However, more must be done. I have not yet seen the market step up with real solutions to the problems. There are few companies, not to mention leaders, joining me in calling out the issues and pushing for meaningful change. As the leader of a trade association, I hear I’m not supposed to rattle too many cages. But I see my role as one that guides a transformation in the economics so that that we can continue to fund the content that consumers love to view, share and interact with for the long term. This means calling out issues and uncomfortable discussions that, at times, involve our own members. Perhaps my role is to also change the nature of a trade association in an accelerated world (or maybe this is a fast exit to the early retirement door). Regardless, promising young content sites like Vox, Refinery29 and Quartz, as well as brands that have been around for decades, are creating high-quality, trusted experiences for consumers and advertisers—each in their own unique and innovative ways. I want these businesses to absolutely crush it and be around for a long time to come. We need more leaders to step up. Enough hand wringing and talking about the problems, let’s see some real change. Across each of the key issues we’ve surfaced this year, there have been countless opportunities for companies and leadership to step up and take bold action to make a difference. For now, I’ll just highlight the most egregious misses in my mind. Bombs have been dropping regarding the level of digital advertising being served to “bots” rather than humans. As with many issues, the industry has been slow to react. The first year was spent deciding whether to call them bots, invalid traffic, non-human traffic, or God-forbid: “fraud.” All the while, Bob Liodice, CEO of the Association of National Advertisers (ANA), has dutifully led the charge calling out the fact this cancer is “funding criminal activity” and we need “a true call to action to stop this.” I completely agree. Yet I was shocked last week by a fact discussed on an industry panel: An estimated 18% of “bot” traffic comes from data centers according to the seminal report on non-human traffic that was produced by the ANA and White Ops (page 26). As Michael Tiffany, CEO of White Ops, stated, “I think that successful botnets doing ad fraud today out of data center IP addresses is obscene.” That’s the right word for it. For the less technical readers, there are very few instances in which human traffic would be coming from a data center such as AWS (Amazon Web Services). Independent researcher, Augustine Fou, breaks down the problem quite well. And Distil Networks also published a bot report (p. 6) last month that shows a number of hosting companies in the list of top sources of bot traffic. Opportunity to Step Up: The dozens of ad networks and exchanges currently thriving in the programmatic space. The buyers and their trade groups should absolutely demand that all ad exchanges, ad servers, networks and 3rd party sellers of inventory block data center IP traffic to ads or, better still, those ad networks should simply step up and block data center IP traffic now. We have already surpassed 200 million instances of ad blocking software installed. I’ve heard of DCN member sites with as low as 10% of their ads being blocked to as frighteningly high as 80%. As I wrote back in March, this is a massive issue. It’s not going away and it’s only going to get worse without real change. TechCrunch covered the issue in depth last week and, like us, connected the dots to privacy. But according to the Financial Times, rather than initiating cross-industry discussion and action about the issue, Google instead chose to negotiate a deal in a dark room with Adblock Plus to whitelist their text ads across the entire web thereby ridding them of most of the problem. We’ve got to rebuild consumer trust in advertising so consumers won’t take steps to block all ads. Over the long term, that probably means less bottom of the barrel direct response retargeting ads and more brand campaigns that excite and engage with consumers. It’s no secret that much of the digital media industry is still finding its way through the wilderness as we move to the viewable currency. The current standard is clearly defined by the independent Media Ratings Council (MRC) is that a minimum of 50% of the pixels of an ad must be displayed for a minimum of one second. Any deviation from the standard causes confusion in the marketplace. Most premium publishers agree with their agency and advertising partners that a move to a viewable impression is a good thing. The process of getting there so that the additional value of a viewable impression is realized has been difficult. Calls for engagement beyond the minimum opportunity to see have been frustrating, but to me Facebook is much more worrisome. Opportunity to step up: Facebook. Needless to say I found myself shaking my head at a recent publisher event where sites were discussing how they could block Facebook from tracking their users. How on earth did this become a responsibility of the publisher to hack together a short-term solution? The Federal Trade Commission (FTC) will likely release more guidance this year on native advertising. It’s unfortunate to me that the bar isn’t being raised across the industry ahead of their intervention. I still see way too many instances of “You may also like this” rather than a clear label of advertising. Last week, Mike Zaneis at the IAB once again called out that this wasn’t likely to be enough. However, most premium publishers are clearly labeling as Michael Sebastian wrote today on Ad Age. Opportunity to step up: Facebook wins again. Ruthlessly weed out clearly deceptive advertising. 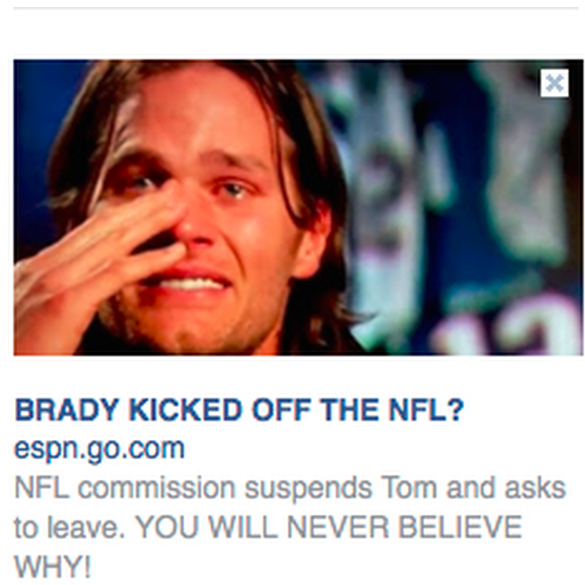 It pained me to receive this ad the other day falsely labelled as content from ESPN that actually linked to this site. This goes beyond simple deception and is a clear violation of all sorts of intellectual property issues. These are just a few of the issues where organizations have the opportunity to do more than form task forces that spend months merely discussing and defining rather than doing. Tim Cook has it right. We don’t want to be the kind of industry people can’t trust. Our businesses and brands are built on trusted relationships with consumers and advertisers. These relationships crumble without trust that the media will deliver what the consumer or advertise expects. We need some heavy hitters to get in the game and turn it around. The future of the industry depends on it. As the digital ad spend rises, so does the amount of non-human traffic online. That is no surprise to Brian Pugh, comScore’s SVP of Audience, who has been tracking the issue for about 15 years. In those early days, says Pugh, no one wanted to talk about it; non-human traffic was one of the internet’s dirty little secrets. The bad news is that has grown a lot since then. The good news is that today people are discussing it openly and solutions are emerging to address the problem. comScore has been working to address the issue of fraud since the launch of its Media Metrix product in 2001, and the company’s acquisition of MdotLabs last summer signaled a significant push to weed out fraudulent traffic in order to accurately measure and report on audiences. MdotLabs co-founder Timur Yarnall joined comScore as SVP and anti-fraud evangelist, to help educate the industry and marketers, many of whom still think viewability is all they have to worry about. While both Yarnall and Pugh note that scammers continue to change their tactics in order to counteract the anti-fraud measures put in place by publishers, they also highlight the creativity coming from the media, marketing and measurement side of the equation in addressing these issues. What’s key to staying ahead of what’s sure to be an on-going issue is the sharing of information and continued efforts by leaders in the industry to shine a light on the problems as well as the victories in combatting fraud and non-human traffic. And while fraud will never be entirely eliminated, Yarnall’s goal is to make it much harder and more expensive for fraudsters to exist.